It can be a sign of heart, lung, or stomach problems, so see your doctor to rule out those causes. Sometimes, though, it’s a symptom of depression. Depression can also raise your risk of heart disease. 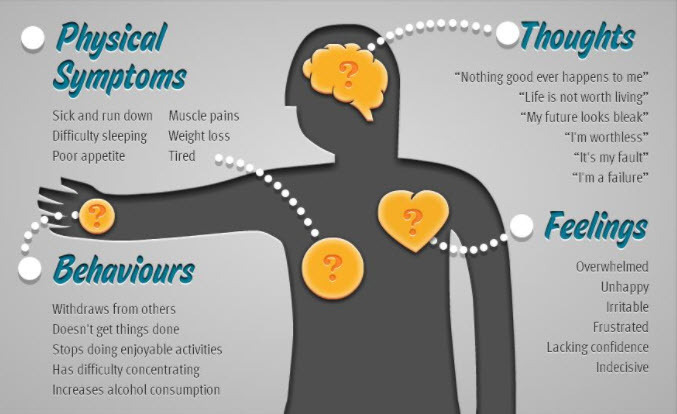 Plus, people who’ve had heart attacks are more likely to be depressed. If you feel so tired that you don’t have energy for everyday tasks, even when you sleep or rest a lot, it may be a sign that you’re depressed. Depression and fatigue together tend to make both conditions seem worse. It may also lead to pain because the two conditions share chemical messengers in the brain. People who are depressed are three times as likely to get regular pain. Our brains and digestive systems are strongly connected, which is why many of us get stomach aches or nausea when we’re stressed or worried. One study shows that depressed people are three times more likely to have migraines, and people with migraines are five times more likely to get depressed. Some people feel less hungry when they get depressed. Others can’t stop eating. The result can be weight gain or loss, along with lack of energy. Depressed people have been linked to eating disorders like bulimia, anorexia, or binge eating. When it hurts you there on a regular basis, it may be a contributing factor. And people who are depressed may be four times more likely to get intense, disabling neck or back pain. Sleep problems or other symptoms can make you feel this way. Men are more likely than women to be irritable when they’re depressed. Although physical activity alone won’t cure it, but it can help ease it over the long term. If you’re depressed, it can sometimes be hard to get the energy to exercise. But try to remember that it can ease fatigue and help you sleep better.